If you often travel with an iPad, iPhone, and other gadgets at once, you probably know the fear of accidentally losing one of them. To tame this fear, check out the GRID-iT Wrap 10 iPad case. The GRID-iT is an iPad sleeve with a secret; it has a storage grid! The storage grid is highly customizable and can hold numerous gadgets and accessories such as iPhones, chargers and headphones. 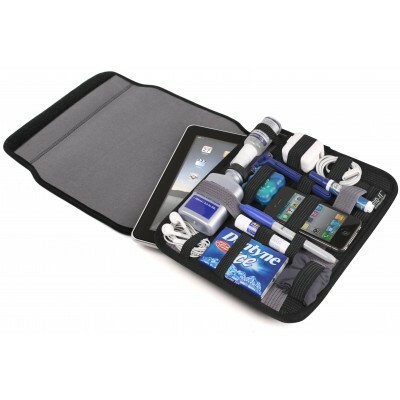 This allows you to keep your iPad protected while keeping the rest of your essentials organized. It can easily become a frequent traveler’s favorite carry-on! The case is made of a soft neoprene available in three sleek colors. This durable material ensures your iPad or other tablet will stay scratch-free when stowed. The straps are made of rubberized elastic bands and are tight so you don’t need to worry about items falling out of the storage grid. The GRID-iT Wrap 10 is available for $29.99 and fits most 10″ tablets such as the iPad 1/2 and HP TouchPad. You can buy this case atCocoon Innovationsand many third-party retailers.